Why the Book of Mormon? Allah CAN have a Son!! Bible's Plant Eaters turned Carnivores?? Is Jacob's stick trick scientific?? Where are the Bible's Unicorns?? Are Dinosaurs in the Bible?? Is Islam & Christianity compatible?? 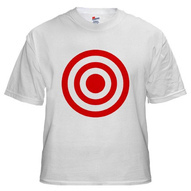 I've notice many Christians seem to love wearing a bulls eye. Especially here in the States,its as if they feel their lives are too comfortable. Perhaps its because we don't have people kicking down our doors and dragging us out to be shot for our faith, that many of us feel like we are not living a victorious life. Perhaps its our ease and convienences at our fingertips that has us worried that we are not getting the opportunity to be subjected to enough persecution to be commended by God. So instead of thanking God for placing us in a country with religious freedom, we find many insisting that God turn up the heat upon all of us. Now especially with the nearness of an imminent Rapture, we find people instead of joyfully and hopefully looking forward to it, rather back peddling and insisting the Church go through the time of Jacob's Trouble (the Great Tribulation). Most of this has been spearheaded by those of the Mid and Post Trib view, but has been a long held by Amillennialist All of them hold one thing in common. That is they have an ardent belief that it is only through great suffering or martyrdom one can be worthy of Jesus calling to be a Christian. One obvious reason why this is Biblically false, is this makes Christianity works based. Another not so obvious reason is that not only are we all different people who go through different experiences, but we are not all called to do the same things. Therefore it only stands to reason we are not called to suffer in the same way as the person next to us. Are all Christians the same? Are any two persons 100% alike? Even identical twins aren't as "identical" as most people thought. 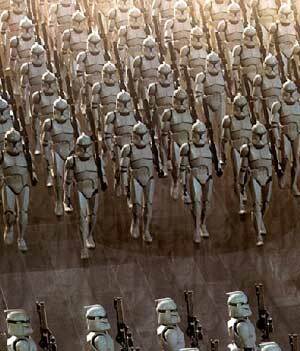 And a big surprise for everyone is that even clones aren't "identical". Will a Genetic Clone Look Exactly the Same as the Parent Organism? What makes them different is the sum of their experiences and environment. If clones can't even be identical, how can we assume Christians will be? Do we all come from the same DNA or the same part of the world or even the same time period? Criminals were beheaded or thrown to vicious animals back throughout history. But today's criminals die by lethal injections. Should we be executing criminals by the same means all the time. This is the folly of a one-size-fit-all mentality. Yet this is what is being demanded by these Christians when they insist that since other Christians are being martyred for their faith, they should not be let off the hook until they are likewise martyred. 18 Verily, verily, I say unto thee, When thou wast young, thou girdest thyself, and walkedst whither thou wouldest: but when thou shalt be old, thou shalt stretch forth thy hands, and another shall gird thee, and carry thee whither thou wouldest not. 19 This spake he, signifying by what death he should glorify God. And when he had spoken this, he saith unto him, Follow me. 21 Peter seeing him (John) saith to Jesus, Lord, and what shall this man do? 22 Jesus saith unto him, If I will that he tarry till I come, what is that to thee? follow thou me. 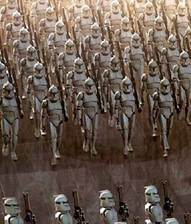 So just like the clones in the clone army of Star Wars, we as Christians are called to resist the Devil in the army of God. Just like the clones we may all have the same rebirth in Christ, but we have different abilities (gifts) and specialties. Some excelled at reconnaissance while others are better with heavy artillery, and still others work as tankers and fighter pilots. Some specialized in desert or mountainous terrain and others jungle or water. However we all could be called to die, at a moments notice, or suffer for the cause. But we equally might not be. God calls us all to do different things and to do our utmost. Think of us as the Grand Army of God, diverse but unified. Does tribulation and martyrdom make one more of a Christian? Sometimes, one's view expose what is truly in the heart and intention of a person. Many Christians, when you strip it all the way down, will find that they have an underlying desire to be part of the persecuted/martyred crowd because they feel it makes them better or more valuable than those who do not. But in order for this to be true, we would have to be using a worldly value system. However, God's value system is completely different and doesn't involve measuring using "self righteousness". 27 For as many of you as have been baptized into Christ have put on Christ. 28 There is neither Jew nor Greek, there is neither bond nor free, there is neither male nor female: for ye are all one in Christ Jesus. 29 And if ye be Christ's, then are ye Abraham's seed, and heirs according to the promise. 11 Where there is neither Greek nor Jew, circumcision nor uncircumcision, Barbarian, Scythian, bond nor free: but Christ is all, and in all. As you see God doesn't see any of us better or worse, advantaged or disadvantaged over anyone else. We are all equals to him. Nothing gives us more of an advantage going into the Kingdom than something else. Only by having Jesus' righteousness do any of us get into Heaven. Unlike worldly standards, no one can earn righteousness by suffering or dying for our faith, otherwise you'd be working your way into Heaven. Sadly too many people treat Heaven as something earned instead something given by grace and accepted. This is not to say that one can necessarily loose their salvation. However the pursuit of such a worldly sign of salvation would cause me to question if they ever truly were saved. Because if one is saved by believing in Jesus, they would show the fruits of love, mercy, humility, and gracefulness instead. Are all tribulations the same? There would seem to be two tribulations Jesus mentions. But too many people like to lump them into one. For verily, when we were with you, we told you before that we should suffer tribulation; even as it came to pass, and ye know. These passages describe a tribulation from the world or man for being a Christian. This tribulation we are told to expect. If we do experience it we are not to be surprised. It is can vary from verbal abuse to downright martyrdom. However there is another tribulation to come. And at that time shall Michael stand up, the great prince which standeth for the children of thy people: and there shall be a time of trouble, such as never was since there was a nation even to that same time: and at that time thy people shall be delivered, every one that shall be found written in the book. For then shall be great tribulation, such as was not since the beginning of the world to this time, no, nor ever shall be. Notice that this is called by Jesus, Daniel, and John the 'great tribulation'? Jeremiah calls it a time of 'Jacob's trouble' mirroring Daniel saying it is only for his people, Israel. This is the last prophetic week of Daniel, which is 7 yrs. So obviously this isn't meant for the Church to experience as even in Matthew 24, the Church was not yet in existence and Jesus was talking to Jews about their great tribulation period at the end of time, just before the 2nd coming of Jesus. We are all called to do different roles and different amounts of suffering. Just because one person is called to die for his faith in Christ, doesn't mean you necessarily might be. In a way it is like coveting something you can not have. And just because you were not called to suffer identically doesn't make you any more or less of a child of God. Likewise for that person, death for Christ doesn't make him more or less of a child of God than you are. Our citizenship in Heaven is not dependent upon merit we earn by suffering, martyrdom, or effort. No true Christian should ever in their right mind be wishing suffering or trouble upon others much less fellow believers. I'm sure none of the martyred apostles or Christians would wish what they went thru on anyone else much less their brothers or sisters in Christ. I'm sure if they had a say they would rather all Christians never have to suffer persecution or death as they did, and rather wish them all nice quiet lives. Can the rest of us, living today, do any less for each other?